Nucleus Research outlines why Acumatica’s latest enhancements make good business sense. If you haven’t looked under the hood of Acumatica R2, you won’t know if this September 2018 release is right for your business. 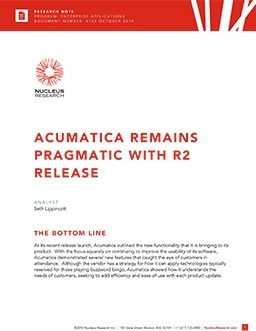 Nucleus Research recently attended the R2 release event and analyzed the new functionality Acumatica is making available. What does this mean for your business in 2018 and beyond? Find out in a free report. How Acumatica R2 compares to previous releases. What “practical enhancements” Acumatica is making available. Which four key developments you need to know about most. What three Acumatica customers told Nucleus in exclusive interviews. Why Nucleus says Acumatica is taking a “pragmatic” approach to development. You’re about to find out why Acumatica R2 can deliver on the needs of thousands of midsized businesses. Read the report now. This report is offered by Acumatica, a leading provider of cloud business management software that gives mid-sized companies a complete, real-time view of their businesses—anytime, anywhere.